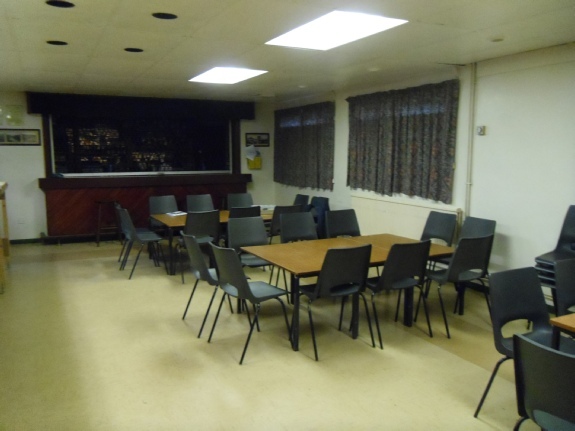 The clubrooms of the Railway Enthusiasts' Club are located adjacent to the M3 Motorway off Hawley Lane (the B3272). 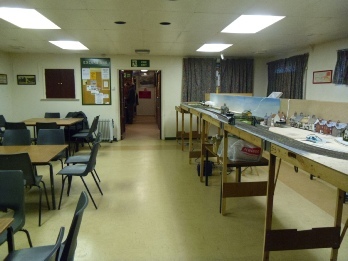 They comprise a main hall, licensed bar, kitchen, library, railway model store and the usual conveniences. The main hall is some 23ft by 32 ft.
During the early part of each week the Clubrooms are reserved for railway activities, with Tuesday being the weekly club night. Every Tuesday, except for the odd occasion , one layout is on dislpay/running. See our programme for a running timetable. The latter part of the week is given over to lettings to members of the public for the organisation of meetings, parties, discos, wedding receptions etc. Tables and chairs are available. There is a lobby which can be used as a buffet servery adjacent to the kitchen. The kitchen contains a fridge and cooker - these are normal domestic models and are not intended for mass catering.